We believe that the children’s book industry in Australia has lost sight of the realities of the market particularly in terms of pricing, supporting Australian authors and ‘fair dinkum’ Aussie stories. Americans would embrace good Aussie yarns, if we marketed our stories to them. It is therefore our mission to provide a uniquely different experience to our readers. We are not part of any global institution, enabling us to provide more personal, flexible and intimate service to our readers. The content, illustrations and themes of all our books are carefully developed to make readers (children and adults) have a happy, delightful, and humorous experience. We introduce some rhyme, as children love it, but in moderation. Our advantage over most children’s authors is that we illustrate our stories. They evolve from the development of illustrated characters first, to which we then ‘wrap’ around the story – not the other way around. We have extensively researched ways to keep the cost of our books below most Australian retail prices, but still retaining quality and Australian content. As challenging as this is, we have managed to keep all facets of publishing, bar printing, within Australia. Respecting that there are readers who prefer purchasing through the large book sellers, we have made our books available through a number of online bookstores. For those that prefer the ‘personalised approach’, we make all the hardcover copies only, available directly from our website. A signed (original) copy of your purchased book by the author. We sell the original artwork from each book (framed or unframed). We also provide a service of making available printed copies (unframed in A4 size) of all the artwork in our books. With reference to being a children’s author, he is unknown. 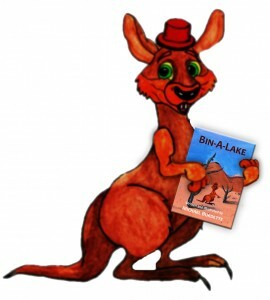 Bin-A–Lake is his first published children’s book. Michael, has however, written six personalised books for specific children, where they are the main character. Writing books, however, is not new to Michael. He wrote, illustrated, and successfully published two business books, ‘Contemplate Your Business Navel’ and ‘The Fox, the Pig and the Owl’. Having served in the South African military, Michael went on to do mechanical and industrial electronics engineering before immigrating to Australia in February 1883. From there he went on to become a business turnaround expert and from 1990 was successfully self-employed. It was during this period where his passion for writing evolved. Michael has always been a great storyteller with many children over the years enthralled by his African tales. He has a passion for native Australian animals, birds, and critters. As a self-taught artist, Michael illustrates all his own work. Michael is not one of those writers who are ‘just having a go’ at writing, he has attended various courses in children’s writing through recognised education institutions in the USA, UK, and Australia. Bin-A–Lake, first written in 2005, has taken ten years to get to the publishing stage with many iterations. It is only one story in a series and there are another five stories just waiting to be refined, honed, and published. Rather than retiring, Michael is fiercely determined to keep working, and there is no better way to keep occupied than to write and illustrate picture books and chapter books for children.